We are a group of researchers and institutional, long term orientated investors pursuing a world at social, economic and environmental equilibrium. We intend to share our thoughts, experiences, tools, frameworks and in depth comments on exciting projects to contribute to the crypto movement. We are convinced to find ourselves at the verge of the next multi decade innovation cycle which will lead to the biggest migration of value in the history of humankind while providing the tools we urgently need to solve the most pressing problems of the 21st century. The export of cryptographic technology and devices was restricted by US laws until 1992 and slowly eased until 2000. Law enforcement and intelligence agencies took the privilege of developing surveillance technologies at global scale with unprecedented levels of efficiency over the past decades. Aaron Swartz, Edward Snowden, Julian Assange and most recently Chris Wiley demonstrated how vulnerable and fragile our democracies as well well as our mostly uneducated or indifferent populations are. Despite severe hacks, mind manipulation at broad scale and the rising power of GAFA and secret services it is still challenging to raise the public’s awareness for privacy and self sovereign digital identities. Governmental efforts like GDPR are undermined by the 5-eyes initiatives, secret programs or new laws such as CLOUD. We believe that the time has come to care about privacy and defend ourselves. We support researchers active in different fields of applied cryptography like ZKsnarks, ring signatures, sMPC and projects building the privacy layers of the web3 stack such as Zcash, Monero, Orchid Protocol, NuCypher, Keep Network or filecoin. We are living in the network era. Huge empires have been build on user data. 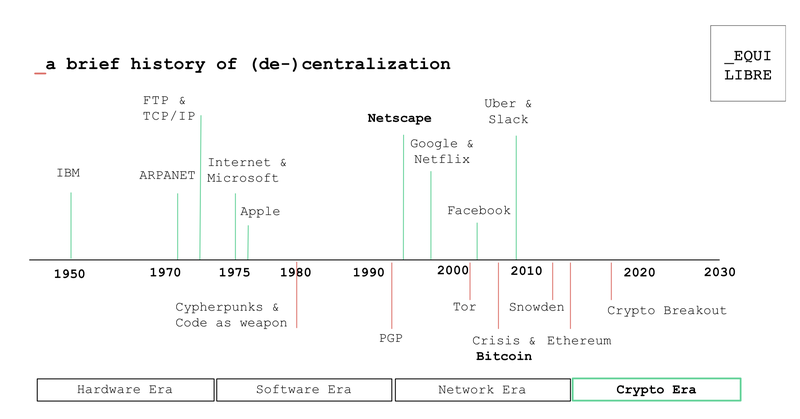 After the phases of open source platforms and growth we entered the final phase of the innovation cycle — consolidation. Companies of significant size either get acquired or smashed due to market power — think of google excluding competitive services from their ranking algorithms or the amazon controversies. Strong network effects and privatized data silos combined with access to global top talent and the world’s most sophisticated machine learning algorithms will further cement the market dominance of some very few protagonists over the next decade. We believe that this concentration of market power is a severe threat to open and free markets and all of its participants. We support projects decentralizing markets and liberating data to the benefit of humanity such as Enigma Project, XAIN, Augur or Ocean Protocol. Nation states, legislation and law enforcement processes seem archaic to us. Lobbyism, lacking transparency of political decision making and corrupt elites led us into wars, the banking bailout in 2008, the VW Diesel environmental crises and an overall inefficient and unjust distribution of wealth and resources. We believe that power corrupts and humans are not trustworthy. We envision a future where democratic decision making processes are transparent, upgradeable and to a certain degree self executing. Cryptographic incentive schemes could become important pieces of these systems which is why we support projects experimenting with new consensus mechanisms and upgradeable governance like Aragon, Tezos, Democracy Earth, Colony or Decred. Crypto @ IndexVentures covering crypto. #opendata #privacy #decentralisation | Ex @Earlybird VC, @Google | views are my own. Thoughts on the crypto economy by blockchain researchers and long term oriented institutional investors.